I somehow managed to make it through all of middle school, jr. high and high school without ever cracking open a copy of Lois Lowry's The Giver. This wasn't due to the fact I was trying to avoid the work; I can remember seeing other kids reading it all around me in my seventh grade year and the cover with the old man and his wiry beard is an image that will always strike me as intriguing, but for one reason or another I was never made to sit down and read it and by the time I was in high school it was a distant memory. Why a feature film adaptation hasn't been made before now is quite curious, but with the recent wave of young adult adaptations it is also pretty clear why we are getting a version of this story now. Unfortunately, despite the fact Lowry tapped into exploring the themes and ideas present here in a way that younger audiences might understand first this doesn't automatically mean the film version will be as appealing or revelatory. Today, we live in a world of Harry Potter and Twilight where books that teens actually read are turned into massive franchises ultimately marginalizing the literature. In this world every quasi-popular series has been taken, given the Hollywood treatment in an attempt to launch a franchise and if they fail they're never heard from again. It is a vicious game won only if you have a large enough, pre-determined fanbase. There have been some unfortunate casualties (Beautiful Creatures) and some that were dead on arrival and deserved to be (The Mortal Instruments). Still, as the pack exists right now it is The Hunger Games and everything else. 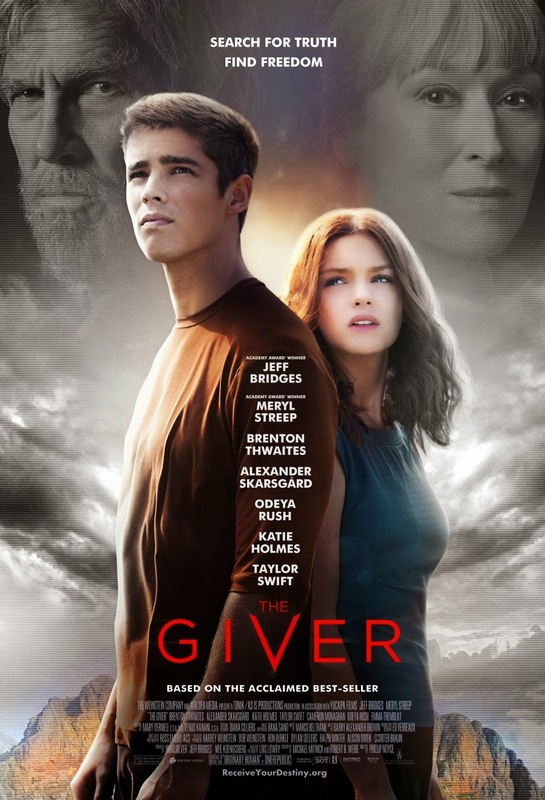 There is an air of earnestness about this version of The Giver though from the construction of its aesthetic to the performances given by actors that would widely be considered above this material that it doesn't have to be the big kid on the block. Sure, it is another cautionary tale set in a dystopian future (though the Chief Elder would have you believe it's a utopia) where one young person who has grown accustomed to a certain, strict way of life is declared different and breaks the societal rules that eventually lead him/her to discovering what the adults couldn't, but there is something sincere trying to be said here. There is an honesty to the production and a conviction in its story and ideas that is hard to shake while completely satisfying as a movie-going experience. 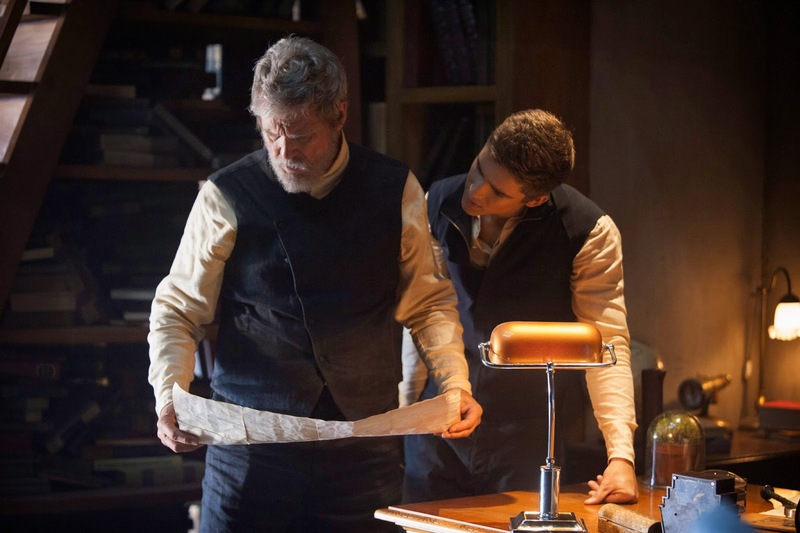 The Giver (Jeff Bridges) passes on his knowledge to Jonas (Brenton Thwaites). The future, wrapped in fog and isolated to a flat space atop a mountain has been streamlined for successful results with no room for artistic or emotional indulgences. One might say this is all a big metaphor for big studio movie making these days, but I digress. The question sits at the head of the film: Is the absence of emotion, of love worth the absence of all conflict? It is a tempting world to want to live in and the citizens of this unspecified community in an indeterminable future seem to think they are doing just fine by it, but that is only because they know nothing else. Enter Jonas (Brenton Thwaits), an inquisitive and eclectic young man who has failed to paint a target on his back that places him into an easily classifiable role once he reaches a certain age. As the adaptation of Veronica Roth's Divergent showed earlier this year how she pretty much plagiarized certain elements of Lowry's novel, there is a ceremony in which the youths of the community are given their assignments that will dictate how they carry out their adult lives. Instead of getting assigned to be a pilot or nurturer as his best friends Asher (Cameron Monaghan) and Fiona (Odeya Rush looking like a young Mila Kunis) do or working within the Justice Center as his mother (Katie Holmes) does Jonas is chosen to be the next Receiver of Memory. This essentially means Jonas will become the one who absorbs all knowledge of the past world from the past receiver who is now The Giver (Jeff Bridges). You see, all of the memories from before the community was formed have been erased and so no one remembers anything, but the Receiver of Memory is important in cases where the Elders who run the community (represented here in the form of Meryl Streep) must seek guidance on decisions that might be best made if they were able to take cues from their own history. As The Giver begins to share more and more of these memories with Jonas though it becomes clear there are more secrets holding his community together than there is truth and honor. As I sat experiencing The Giver I couldn't help but to wonder if the predominantly tween to teen audience was grasping the ideas the film was tossing about. Granted, the filmmakers were smart enough to convey much of these thoughts through the pretty mug of Thwaits so I'm sure it had much of the female audiences attention, though I still couldn't help but to wonder if this was engaging them as much as I was surprised to find it pulling me in. The trailers had purported a film filled with sci-fi style action and an artistic design in line with last years young adult flop The Host, but what we actually receive is a much smaller-scale experiment that doesn't depend on its scope, visual effects or love story to pull the audience in as much as it does its ideas. The ideas are key. Yes, there are a few scenes here and there that one could label as action and there is naturally some implied tension between Asher and Jonas for the affection of Fiona, but none of these elements are ever made to be the central focus of the film. No, the focus lies on the ever expanding pool of knowledge form which Jonas is gathering from The Giver and how that effects the rest of his life and how his perspective on his world begins to change. He is told at the beginning of his training as Receiver of Memory that he is not to share anything he learns, but he can't help but to begin to integrate the power of emotion onto those around him or resist the temptation of seeing if they might reciprocate or even recognize what he speaks of. The Elders preach "sameness" as a way to avoid murder, war, one individual thinking they are better than another etc. and to emphasize this "sameness" and this absence of emotion director Phillip Noyce (Patriot Games, Clear and Present Danger) chooses to deliver the majority of his film on a black and white canvas. Only when Jonas begins to open his eyes to the world beyond his small community does color begin to seep into the screen. It is by no means a subtle way of reinforcing the aspect of our protagonist, but it's a rather brave choice and one that clearly demonstrates to the films target audience the difference in knowing what something is and experiencing how something feels. Jonas tries to explain to Fiona (Odeya Rush) what it means to feel. What I probably enjoyed most about The Giver though was its ability to present a hopeful idea of humanity through the eyes of a hypocritical structure. The Elders, by trying to eliminate murder, hate, racism and all other repulsive tendencies of the human race, end up bringing certain reprehensible actions back as if necessary. By trying to control every aspect of life and create a civilization of people as if they were toys on an assembly line they have essentially created a "sameness" that is a sustained innocence. The film and its narrative are admirable for never leaning too far one way or the other while its heroes and villains are still clearly defined. We understand the hopes and ambitions of what the Elders have tried to create, but in doing so they have defined an existence void of any kind of feeling or risk and if you can't feel, what is the point? There are plenty of ideas in line with this type of society that have clearly been set up so that such questions could be asked in the first place, but they are thoughtful questions and while I don't know how faithful this film adaptation stayed to the source material it is at least gratifying to see a film of this genre shoot for something more than the heroine choosing the right guy or the bad guy being defeated because they were bad. Admittedly, the film does tend to drag slightly in the final act and at an even 90-minutes that isn't great, but it is quick to redeem itself with some great editing that brings home the objective and augments Bridges already inspiring and admirable performance. Thwaites should also be commended for a genuine performance while also being able to convincingly pull off playing fifteen when he is ten years older than that in reality. The likes of Alexander Skarsgård and Taylor Swift aren't used for much (Swift is nothing more than a cameo which is probably best for all parties involved) and the same could be said for Holmes who delivers her futuristic language in awkward fashion, but the presence of Streep and Bridges alone is enough to appreciate the attempt here. I went into The Giver not knowing what to expect exactly, but came out rather floored by the intent of the aspirations and the unconventional (at least in these kinds of movies) ways it went about delivering its ideas.